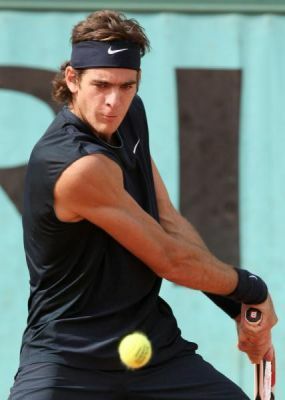 Juan Martín Del Potro was born 23 September 1988 … In April 2009 reached a career-high ranking of No. 5 … In 2008 became the first player in ATP history to win his first four career titles in as many tournaments … Captured his maiden Grand Slam title at the 2009 US Open defeating Roger Federer in the final … Runner-up at the 2009 ATP World Tour Finals. Nicknames are Enano, Palito and Delpo... Juan Martín del Potro began playing at age seven … Father, Daniel, played semi-pro rugby in Argentina, and works as a veterinarian, and mother, Patricia, is a teacher...Has one younger sister, Julieta...Childhood idol was Pete Sampras and admires Marat Safin...Speaks Spanish and some Italian and English. Favorite surface is hard court... Says if he wasn't a tennis player, he would look to pursue a career in architecture... After winning his first ATP title in Stuttgart in July 2008, gave his CLK Mercedes-Benz to his sister, Julieta.... Coached by former ATP pro Franco Davin (since March 2008). 2009 Was the youngest player in year-end Top 10, finishing a personal-best No. 5… The top South American on ATP World Tour. Captured three titles and reached his first ATP World Tour Masters 1000 final in Canada. At US Open he captured the title with back-to-back wins over No. 3 Nadal in SF and No. 1 Federer in final in five sets (rallying from 1-2 set deficit)…Became first player to beat Nadal and Federer in a Grand Slam tournament and first Argentinean to capture US Open since Vilas in 1977… Reached final at Barclays ATP World Tour Finals in London by posting round-robin wins over Verdasco and Federer, Soderling in SF before falling to Davydenko in final… Juan Martín del Potro earned a career-high $4,753,087.